On July 1, 2015, the U.S. and Cuba announced an agreement to restore diplomatic relations. This post will discuss Cuba’s announcement and reactions. A prior post did the same for the U.S. announcement and reactions. 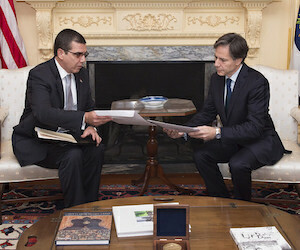 Cuba also confirmed that on July 1 Jeffrey DeLaurentis, the Head of the U.S. Interests Section in Havana, had delivered to the Cuban Foreign Ministry a July 1 letter from President Obama to President Castro that was quoted in the prior post about the U.S. announcement of restoration of diplomatic relations. According to a U.S. reporter for the New York Times, Cubans in the streets of Havana welcomed the news about the resumption of diplomatic relations. Similar positive comments from people on the street in Havana were captured by Granma, the official newspaper of Cuba’s Communist Party. Cuba’s Granma newspaper reported positive reactions to the restoration of diplomatic relations from China, Brazil, the European Union and the United Nations. The Cuban announcement reiterated some of the issues that Cuba has raised before and after the December 17th announcement of rapprochement and that have been addressed in prior posts to this blog. Foremost for Cuba is ending the U.S. embargo or blockade of Cuba. President Obama agrees that this should happen and again yesterday called on Congress to adopt legislation doing just that. Senators Amy Klobuchar, Jerry Moran and Angus King have introduced bills to that end, and in the House Charles Rangel, Bobby Rush and Jose Serano have authored similar bills. Now the relevant congressional committees need to hold hearings and report the bills to the floors of the respective chambers for voting them up or down. Related to ending the embargo or blockage is Cuba’s repeated allegation that it is illegal under international law and has damaged Cuba, allegedly $1.1 trillion as of last October. It is exceedingly unlikely that the U.S. will agree with these assertions and pay Cuba that sum of money. Therefore, this blogger has suggested that this Cuban claim, along with others by Cuba and the U.S., be submitted for resolution to the Permanent Court of Arbitration at the Hague in the Netherlands. The other significant issue for Cuba is ending the alleged U.S. illegal occupation of Guantanamo Bay and returning that territory to Cuba. Again it is exceedingly unlikely that the U.S. will agree with that allegation and demand. Remember that the Cuban government in 1906 leased that territory to the U.S. for use as a “coaling station” or “naval station” and that there are many problems with Cuba’s assertion that it has the right to terminate the lease. Therefore, this blogger has suggested that this Cuban claim and others relating to Guantanamo, including unpaid rent for the last 50-plus years, also be submitted for resolution to the Permanent Court of Arbitration. Cuba’s complaint about U.S. radio and television transmissions to Cuba (Radio and TV Marti), in this blogger’s opinion, is secondary. Again I see no U.S. acceptance of this complaint, and thus it too should be submitted to the Permanent Court of Arbitration. The other secondary Cuban complaint concerns the U.S. “programs aimed at promoting subversion and internal destabilization.” This refers to the covert, secret or “discreet” programs of the U.S. Agency for International Development (USAID), such as its social media program, the HIV workshop program and the hip-hop artist campaign. These programs, in this blogger’s opinion, are a stupid waste of U.S. taxpayers’ funds and should be terminated by the U.S. Any U.S. programs to promote democracy in Cuba should be joint ventures with the Cuban government. Now the more difficult work comes for the two countries’ diplomats to meet, discuss and negotiate to attempt to resolve or at least narrow these and many other issues. We wish them courage, persistence and humility in their work. Statement by the Revolutionary Government, Granma (July 1, 2015); Letter from Cuban President Raúl Castro to Barack Obama (July 1, 2015); Interim Minister of Foreign Relations receives letter from U.S. President to Army General Raúl Castro Ruz, Granma (July 1, 2015); Cuba and the U.S. confirm reestablishment of diplomatic relations, Granma (July 1, 2015); Burnett, Cubans Greet Latest Step in U.S. Thaw With Hope Tempered by Reality,N.Y. Times (July 1, 2015). Prior posts have discussed bills to end the embargo in the U.S. House of Representatives and similar bills by Senators Klobuchar and Moran and King. A prior post concerned the October 2014 U.N. General Assembly’s overwhelming approval of a resolution condemning the embargo and Cuba’s allegation of $1.1 trillion of damages. Arbitration of Cuba’s alleged damages claim was suggested in another post. A post examined the 1906 lease of Guantanamo Bay; another, whether Cuba had a right to terminate the lease and another. arbitration of unresolved issues about the lease. One post looked at the status of Radio and TV Marti. Prior posts have covered USAID’s social media program; the U.S. Senate’s comments on that program; USAID’s HIV workshop program and reactions thereto by the U.S. government and by others; the New York Times’ criticism of the programs; criticism of the programs by the Latin American Working Group; and this bloggers’ open letter to President Obama complaining about the programs. Well done. Betty McCollum introduced a bill to end funding of Radio and TV Marti and we should get behind it and get the other Minnesota Reps who support ending the embargo and travel ban to co-sponsor this bill too. She should be invited to speak at public forums on Cuba. McCollum’s bill is H.R.570: Stop Wasting Taxpayer Money on Cuba Broadcasting Act. Introduced on 1/27/15 and assigned to the House Foreign Affairs Committee. As of 7/2/15, the Committee has done nothing on the bill.To keep tabs on its status, go the Library of Congress’ THOMAS service: http://thomas.loc.gov/cgi-bin/thomas.